In the 1800s, funerals were held in homes, churches and social halls, however in the middle of the century, the tradition began to change. In 1845 the Truesdell and Townsend Furniture & Undertaking Company began operating on Fulton St., Warren. The reason for the furniture and undertaking combination was that pioneers who moved into the area needed furniture, being new to the area, and when a death occurred during those difficult years, they also needed caskets. Early furniture makers also "undertook" difficult & emotional tasks for the family, thus the name Undertaker. Also during the 1850s the trend was to have funeral services in homes or in churches and chairs were needed in addition to caskets so the alliance between furniture manufacturing and caring funeral services were linked from the beginning. In the 1870s Clark and Raider would buy the business from Mr. Townsend and it would become strictly a funeral service operation. 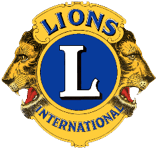 They would operate their funeral service company until it was purchased by William W. McFarland. On July 4, 1897 William W."Will" McFarland bought the Clark and Raider Undertaking and McFarland Funeral Services Company was born. The first location for the new McFarland business was at 112 Park Avenue in Warren, on the Courthouse Square. This location, which currently houses Gene's Jewelers, would soon prove to be too small for the rapidly expanding business and a move was in order. The McFarland family served some of Warren's finest citizens and conducted services for the Packard family, Perkins and Kinsman families along with many other significant individuals such as Halsey Taylor and R.J. Wean. In 1903, The McFarland's moved to their present location the "Grand Old Lady" at 271 North Park Avenue in Warren. W. W. McFarland bought the present historic structure as a home for his family and had an addition built on the south side to serve as the professional funeral offices. W.W. McFarland also had a barn built in the back to house the area's finest Morgan horses for the hearse and a storefront to display caskets. The barn still stands today, although it has been converted to and it still is home to a restored Horse Drawn Hearse. 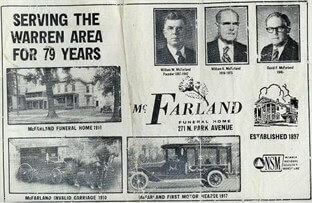 McFarland Funeral Services, always on the forefront of professional funeral service technology, was the first funeral profession, in the area, to switch from horse-drawn carriages and hearses to motorized ones in 1914. They were the first in Trumbull County to have embalming facilities, with updated innovations and are the standard for sanitation and dignity. Later, in 1927, W.W. McFarland had additions placed on the front and back of the "Grand Old Lady" to accommodate even more growth. 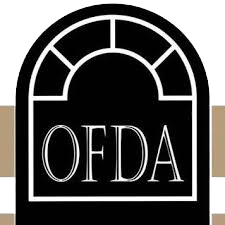 As the business rapidly expanded, W.W. McFarland moved his family upstairs and devoted the entire first floor to the funeral service profession. 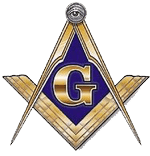 In this respect, he owned and operated the first "proper" funeral home west of Pittsburgh. In 1919, William R."Bill" McFarland would join the "family business" and it would become known as it is today, The McFarland and Son Funeral Home. McFarland's again set the standard for quality and comfort and added state of the art sound system and air conditioning to better serve the community. In 1946, after fighting in World War II, David F."Dave" McFarland would join his father at McFarland and Son Funeral Home to become the third generation McFarland to own and operate the family business. As usual the McFarland lead the way meeting the needs of the Warren area and provided the highest educated Funeral Directors and Emergency Ambulance Personnel. 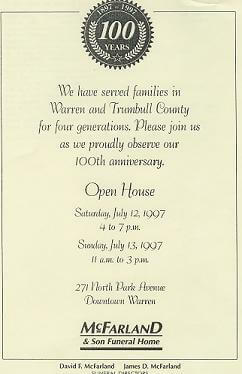 During this time Dave was the first to provide Trumbull Co cremation services which is now 50 years later the choice of many families. The funeral service also operated an ambulance service until 1977 when McFarland and Son and other funeral directors in the area decided that new government regulations and requirements proved to be too much. Early ambulance services were linked with funeral homes because, originally, funeral directors were the only businesses with a vehicle large enough to accommodate someone lying on a stretcher comfortably. In 1978, James D. "Jim" McFarland became the fourth generation of McFarland to join the profession and become its new owner and progressive operator. In 1984, McFarland & Son Funeral Home raised the bar on funeral services with the introduction of insurance funded "pre-planning." 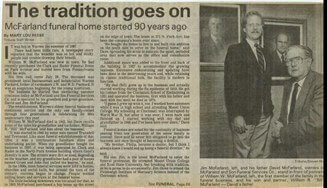 McFarland & Son Funeral Home was one of the first funeral homes, in Ohio able to offer this service to their customers. As always in the leadership of funeral service, McFarland and Son Funeral Home designed the first funeral-based website in the Trumbull County area. 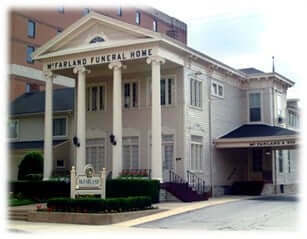 Various renovations and restorations to McFarland's historic home the "Grand Old Lady" in Warren has served to keep the business at the forefront of funeral services. 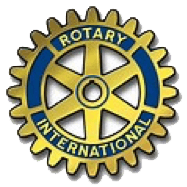 while retaining personal service and classic elegance. | 271 North Park Ave.